IMPORTANT: You need to run the setup software only once to install your adapter. After the setup has been completed, your computer will be able to recognize the adapter each time it is connected to your computer’s USB port. These instructions are applicable for the Linksys AE1000 High-Performance Wireless-N Adapter, AE1200 N300 Wireless-N USB Adapter, AE2500 N300 Wireless-N USB Adapter, and AE3000 N900 Dual-Band Wireless-N USB Adapter. If you are using a different model, click here. If you would like to use the Linksys Wireless-N adapters on your Windows Vista or XP computer, you can use the appropriate driver for each adapter. Just click your adapter model to reach the download page: AE1000, AE1200, AE2500, AE3000. NOTE: If you do not have the setup CD for your adapter, you can follow the instructions here. 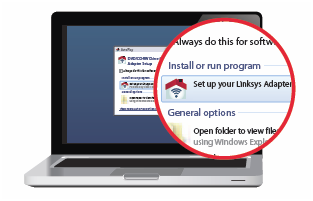 Click Set up your Linksys Adapter once the pop-up window appears. For Windows® 7 / Vista®, go to Start > Computer and double-click your CD-ROM drive. For Windows® XP, go to Start > My Computer. Select your CD-ROM drive and double-click Setup.exe. Follow the on-screen instructions to finish setting up your Linksys Wireless-N adapter. NOTE: If you want help with the on-screen instructions for setting up your adapter using the setup CD, click here. Once installed, you can now connect to your Wi-Fi. For instructions, click here.